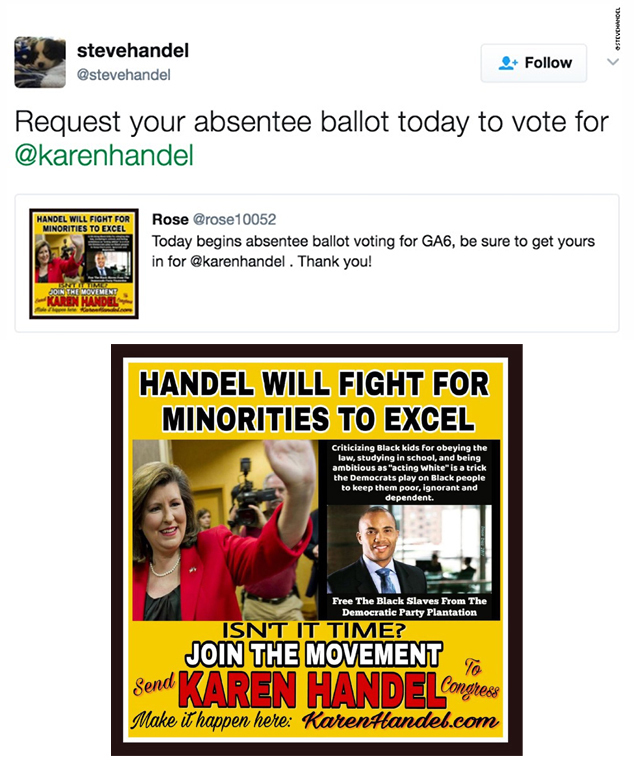 Karen Handel's husband shares meme urging voters to “free the black slaves from the Democratic plantation"
With just over one month to go until the runoff election, the Republican running for Congress in Georgia’s 6th Congressional District is suddenly facing a public relations disaster because of her husband’s social-media share. The race to replace Republican Tom Price, who vacated the seat to serve in President Donald Trump's administration as the secretary of the Department of Health and Human Services, is already the most expensive House race ever. Now the race is garnering national headlines because of one racist and inflammatory tweet. Criticizing black children for obeying the law, studying in school and being ambitious as acting white is a trick the party plays on black people to keep them poor, ignorant and dependent. "Join The Movement," the meme implored. Retweeting the image, Steve Handel wrote a message urging his followers to “request your absentee ballot today” in order to vote for his wife. Early voting began on Tuesday for the June 20 runoff election. Karen Handel placed second out of the 17 candidates who competed in a special election held on April 18. She is now in a tight runoff race against Democrat Jon Ossoff, who nearly won the House seat outright, placing first in last month's contest but failing to garner 50 percent of the votes. Ossoff capitalized on anti-Trump sentiment in a district that has voted Republican since 1979. Trump won the district by scoring only 1.5 percent more votes in November than Democrat Hillary Clinton, who drew support from college graduates in the district's affluent Atlanta suburbs. If Ossoff receives support from the other Democratic candidates, he would have about 49 percent of the vote, the Democratic National Committee's chairman, Tom Perez, recently told CNN. So the Ossoff campaign plans to target as many as 35,000 Democrats who voted in November's presidential election but not during last month’s special election, he explained. The 30-year-old Ossoff raised a startling $8.3 million in the run-up to the April 18 special election — about 17 times what a candidate in a competitive district normally raises, according to The Washington Post. Total television and radio spending in the district is already closing in on $30 million, making this the most expensive House race in history. President Trump raised $750,000 for Handel last week while he was in Atlanta for the National Rifle Association convention. The Paul Ryan-connected PAC Congressional Leadership Fund has also vowed to spend $2.5 million in TV advertising backing Handel beginning on May 10. "Like many of us, he, meaning Steve, made a mistake and retweeted something he didn't pay a lot of attention to, thinking it was just an early vote message. It clearly was not appropriate and has been deleted." The controversial Twitter image has since been deleted by the original poster and has vanished from Handel's account as well.